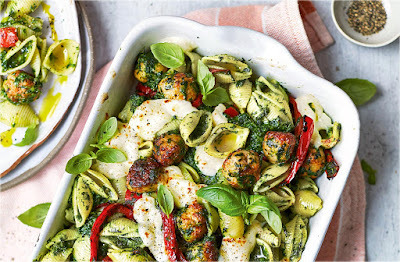 This new pasta bake recipe will soon become a family favourite. Combining a speedy homemade spinach pesto, tasty chicken meatballs and mozzarella topping, this cosy recipe is sure to be a winner. fan 220°C. Bring a large pan of water to the boil. Squeeze the sausage meat out of its casings and roll into cherry-sized balls. You should be able to make 4-5 balls from each sausage.